You've added Bloubergstrand Beach, Cape of Good Hope, Robben Island, and other attractions to your itinerary. Next up on the itinerary: contemplate the waterfront views at Hout Bay and stop by V&A Market on the Wharf. To find reviews, ratings, traveler tips, and more tourist information, read our Cape Town attractions planner. If you are flying in from United Kingdom, the closest major airport is Cape Town International Airport. In March, daytime highs in Cape Town are 30°C, while nighttime lows are 18°C. You will leave for Franschhoek on the 14th (Wed). Situated in a fertile valley between two mountains, the picturesque village of Franschhoek bills itself as a culinary heaven, with renowned wine estates dotting its surroundings. Your day-by-day itinerary now includes The Franschhoek Cellar, Marbrin Olive Growers and Franschhoek Wine Tram. 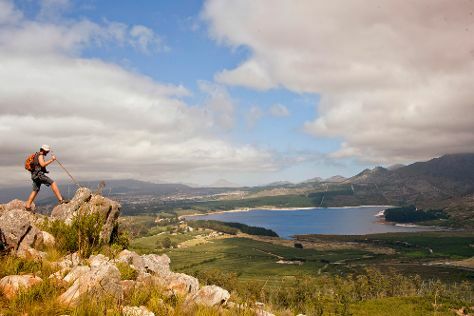 Discover out-of-the-way places like Franschhoek Pass and Leopard's Leap. There's still lots to do: tour the pleasant surroundings at Mont Rochelle Nature Reserve, savor the flavors at Eikehof, and learn about winemaking at Maison Estate. To find more things to do, traveler tips, photos, and other tourist information, use the Franschhoek trip maker site . Traveling by car from Cape Town to Franschhoek takes an hour. Alternatively, you can do a combination of bus and taxi. In March, daily temperatures in Franschhoek can reach 30°C, while at night they dip to 18°C. On the 17th (Sat), you're off toHermanus. 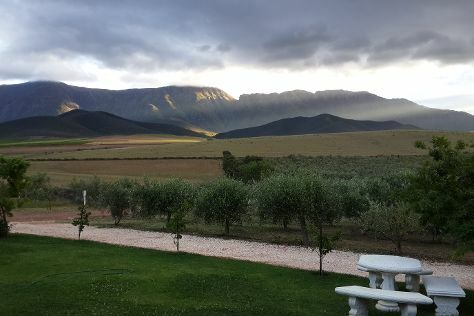 Your day-by-day itinerary now includes Hermanus Country Market as well as Green Mountain Trail. On the 17th (Sat), hunt for treasures at Hermanus Country Market and then tour the pleasant surroundings at Green Mountain Trail. On your second day here, stroll through African Penguin & Seabird Sanctuary and then tour the pleasant surroundings at Stony Point Penguin Colony. To find where to stay, reviews, traveler tips, and other tourist information, read our Hermanus travel planner . You can drive from Franschhoek to Hermanus in 1.5 hours. In March, plan for daily highs up to 30°C, and evening lows to 18°C. On the 19th (Mon), you're off toWilderness. Wilderness Beach has been added to your itinerary. Explore hidden gems such as Meiringspoort Waterfall and Pharoah Art Gallery. When in Wilderness, make a side trip to see The Cango Caves in Oudtshoorn, approximately 1h 25 min away. It doesn't end there: contemplate the waterfront views at Wilderness Lagoon and head outdoors with Outdoor Activities. To see photos, more things to do, and more tourist information, go to the Wilderness online day trip planner . You can do a combination of taxi and flight from Hermanus to Wilderness in 2.5 hours. Alternatively, you can drive; or do a combination of taxi, flight, and bus. Expect a daytime high around 28°C in March, and nighttime lows around 16°C. You'll set off for Plettenberg Bay on the 22nd (Thu). You'll discover tucked-away gems like Lawnwood Snake Sanctuary and Birds of Eden. 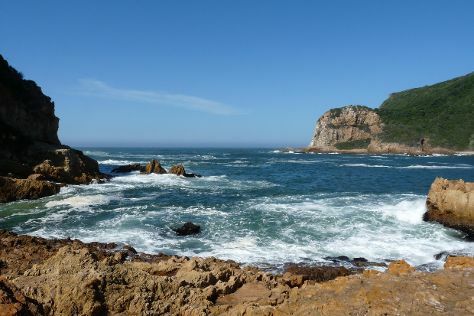 Explore the numerous day-trip ideas around Plettenberg Bay: Knysna (Knysna Heads & Jandreart Studio). The adventure continues: stroll through Radical Raptors. To see ratings, traveler tips, maps, and other tourist information, use the Plettenberg Bay tour planner . Traveling by car from Wilderness to Plettenberg Bay takes 1.5 hours. Alternatively, you can take a bus. In March, plan for daily highs up to 28°C, and evening lows to 19°C. Wrap up your sightseeing by early afternoon on the 24th (Sat) to allow enough time to travel to Stellenbosch. Kick off your visit on the 25th (Sun): explore and take pictures at Stellenbosch University and then engage your brain at Stellenbosch University Botanical Garden. Plan a trip to Stellenbosch easily and quickly by telling Inspirock to suggest an itinerary. You can do a combination of flight and train from Plettenberg Bay to Stellenbosch in 5 hours. Other options are to drive; or take a bus. In March, plan for daily highs up to 30°C, and evening lows to 18°C. On the 25th (Sun), wrap the sightseeing up by early afternoon so you can drive to Cape Town. For other places to visit, ratings, more things to do, and more tourist information, read our Cape Town online travel planner . You can drive from Stellenbosch to Cape Town in an hour. Alternatively, you can take a bus. You will leave for home on the 25th (Sun).